Quick overview Our planet may be insignificant on a cosmic scale, but the evolution of intelligent life here makes it unusual, it is likely to be unique in our galaxy. 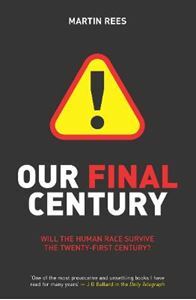 Yet we may be on the verge of destroying int, of destroying ourselves - over the next century the future of life in the cosmos could be either jeopardised - of safeguarded for perpetuity. World authority on astrophysics, Sir Martin Rees, takes us on a journey through all the things which could wipe out mankind in the near future. From asteroids to disease to scientific discoveries gone wrong (from nanobots to the large Hadron collider) these are scenarios from disaster movies, analysed with a serious scientific eye. Some of these things definitely won't happen, some genuinely might - this is one book you won't be able to put down and which you'll never forget.